Yesterday I went with Rachel, Jackie, and Mindy (librarian for the Patients’ Library at the UIHC) to deliver books to the kids at the hospital. It was so much fun to see kids who really have little to smile about light up because they get to choose a book to keep. Or two or three because we had so many. I hope we get to do that again before Christmas comes. Speaking of the book drive, we need more teen/adult books because a lot of patients are not little kids right now (5 copies of Eragon don’t stretch very far). So if you read this blog, and you shop at the Coralville B&N, please donate a book for a teen/young adult to our book drive. Heck, if you shop at any B&N please donate a book or two – a number of stores are partnered with Head Start-type organizations and could really use the help. Scrooge really is right: you need to keep Christmas in your heart and practice it all year round (who wants to tell that to the ruddy bugger who didn’t want to buy a book to donate to a sick child because his taxes do that – excuse me, what?). I think all the muscles from my ribcage down hurt. All. The upside to having Deanna for ballet is that my joints don’t hurt like they always do. She works the body much differently. I love her but I’m in pain!!!! Turns out most of the new patients are a little squirrelly so the nurses would prefer that I not cause trouble and rile up the patients by doing surveillance swabs. I can live with that. We can wait until they’re a little calmer. My office is so cold I think my blood is freezing. I get to play with my nieces tonight!!! Current knitted item: Pretty sock! Help! I’ve been buried by boxes! ouhh, ouhh. Or however you spell Tim Allen grunts. The product for one of our clinical trials arrived today. All two pallets of it. So it took three trips using the receiving dock’s trolley to get it all upstairs (and part of it is in another RA’s office). The receiving guys wouldn’t let me use the motorized pallet driver. Meh. If I wasn’t tired after ballet class (my body thought I was kidding when I said we were going to Deanna’s class today) I certainly am now. And I still have to go out and swab my new patients. And then try and find an article about red and white in Tennyson’s Idylls of the King because that article is from 1967 and isn’t available online through MLA or anything. And then mediate disputes on BNBC because people can’t seem to behave themselves. Who said life is dull? Current movie obsession: Hot Fuzz is hilarious! Survived my first Black Friday ever – the trick must be to close rather than open. I watched the Samantha Morton/Ciaran Hinds version of Jane Eyre. I think that’s my least favorite JE adaptation so far. Morton’s Jane seemed very snotty, not reserved and quiet while Hinds didn’t quite have enough warmth behind the gruffness. The scriptwriter needs to be flogged; Charlotte Bronte wrote plenty of decent dialogue and it needs neither updating or your own “personal touch” to be interesting. I’m off to create a bunch of Middlemarch threads now. Come join us on BNBC. 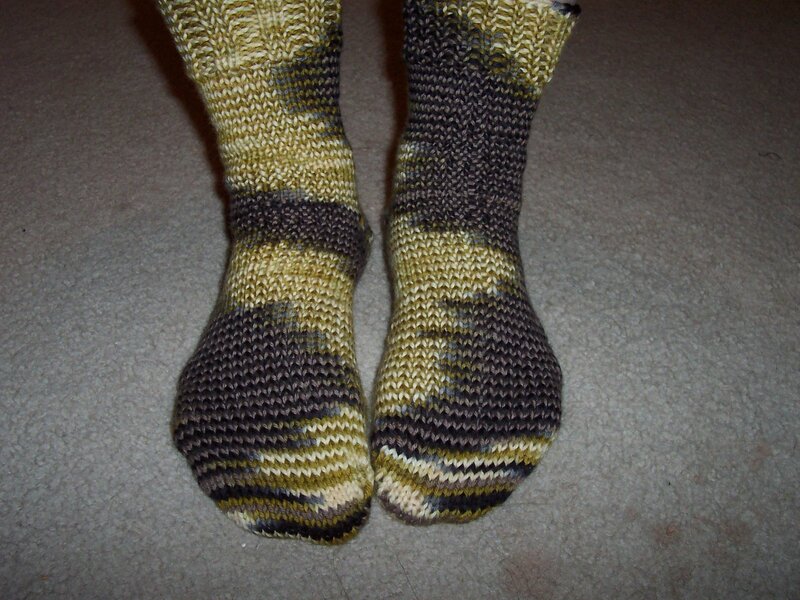 I knitted my first pair of socks. I friggin’ rule! Check them out (I fixed the Chaucer damage – note to self: keep all things made of wool out of the reach of the goat-cat). Knitted from Artyarns Supermerino (hand-painted! ), color 140, these socks are warm. Mmmm, mmmmm. They do have one teensy, tiny mistake – the cuffs are knitted in two different ribs. Look carefully. One cuff is in 2×2 rib and the other is in 1×1. But who cares. My socks fit! Both are knitted from Cascade 220 (my favorite). In other aspects of my life, I found out that the people who ride the mid-day bus are generally very strange. Today there was a man riding with a 4 1/2 foot tall stuffed tiger. No joke. There was also a day care center that took 11 preschoolers on an outing to the Children’s Museum at the mall. Via the public bus. Mental note not to use that day care once I find out who they are. Thanksgiving is tomorrow and for the first time in my life I will not be spending it with my family (or boyfriend’s family). I’m going to Annie’s house to spend the evening with her family and the Donelsons. Should be fun. Please think good thoughts for my parents (who are driving to Illinois as usual) and for my brother (who is working this holiday, so please don’t make him scrape you up off Interstate 80). Current movie obsession: Three DVDs arrived from Netflix today: Hot Fuzz, Jane Eyre (Samantha Morton version), and Angels in America: Part 1; what shall I watch?????? Suskind wrote Perfume in the mid-1980s, set in 18th century France but written in German. It was recommended by the professor for my 17th century Restoration literature class because Suskind managed to convey the dirtiness of cities prior to the advent of sanitation and public health. The amazing thing about this book was how you could “read” the smells right along with Jean-Baptiste Grenouille. I was a bit apprehensive about watching the 2006 motion picture because, well, how can you smell what you see? It’s not quite the same as reading the book but Tykwer did an amazing job with the film. It’s shot beautifully and realistically, lots of close shots to follow smells, and thankfully the scent trails weren’t realized as clouds or anything hokey and cartoonish. I think the casting was well done; I’d heard that some reviewers thought Dustin Hoffman was all wrong, but I think he did very well as a man who is now a caricature of his past. Ben Whishaw and Rachel Hurd-Wood were also excellent (talk about dye job on Rachel’s hair, that was some red). I also finished off Wide Sargasso Sea, a good novel but a very painful movie to watch. The only good things were the scenery and the reconstruction of Afro-Carribean dances. Otherwise Nathaniel Parker is a bit all wrong (he was Mr. Skimpole in the 2005 Bleak House BBC adaptation) and the whole movie just seems to be a vehicle for Karina Lombard to get naked all the time. Boring. I have clean sheets and blankets. And they smell like lavender. And they’re fresh from the dryer. The Hawkeyes lost – to Western Michigan. Got spanked hard, actually. No wonder all the customers decked out in Hawkeye Black and Gold were grumpy after about 7pm.